Tabloid's Most Outrageous Claim Ever: Wii Boxing is "Dangerously Lifelike"
Hey, you know what makes a domestic violence arrest funny and lighthearted? Wii Boxing. At least according to one supermarket tabloid's interpretation of what went down between Charlie Sheen and Brooke Mueller. This just in from the Weekly World News - a Tooth Fairy gazette that straight-faced writes about stuff like Bat Boy and alien abductions of cheerleaders, so consider the source. It's like comic books for old ladies at the hairdo place. In fact, if the Weekly World News reported "Owen Good works for Kotaku," I would call Crecente to ask why I had been fired. 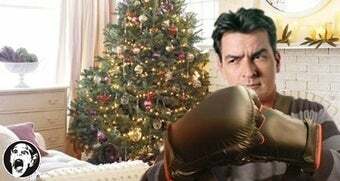 Anyway, they say Sheen - who was in fact arrested - and wife Mueller sparred in Wii boxing, "the dangerously lifelike boxing simulation game." But not realistic enough for the competitive couple. "Soon enough an argument arose over the Wii not being responsive or realistic enough, and a real boxing match broke out in the living room." Mmm hm. WWN says Sheen suffered "three broken ribs and two cracked teeth," and his victorious wife taunted him by text after he got out of the slammer. They also say Sheen's middle name is Inigo Montoya.